TACLOBAN CITY – The skimriders of Tanauan, Leyte bagged the first three places in the 2nd Nasugbo National Skimboarding Competition held at the Nasugbo, Batangas beach on Sunday, April 19. This was learned from Tanauan Mayor Roque A. Tiu who accompanied the Tanauan skimboarders in the national competition. Brando Espada of Tanauan bagged the championship trophy and a cash prize of P10,000. Another Tanauananon, Leo Espada, got the 2nd prize trophy and a cash prize of P7,000, while Dariel Espada won the 3rd prize trophy and the cash prize of P4,000. Mayor Tiu cited the Tanauan skimmers who showed their best forms and were not intimidated by the other participants who are skimboarding enthusiasts from Manila, Zambales and Batangas. The Tanauan riders are cousins, Mayor Tiu said. They will serve as role models to the other youngsters of Tanauan. Because of skimboarding, they are able to go places. 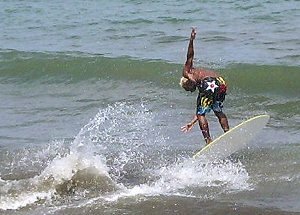 In Tanauan, skimboarding is the past time sports of the young people specially those who live along the coastal barangays, Mayor Tiu disclosed. The Tanauan riders joined the national competition upon the invitation of Nasugbo Mayor Tony Barcelon. “I took the opportunity to promote the Skimboarding Competition in Tanauan come April 28 and come December 2009,” Mayor Tiu said. The skimboarders from Nasugbo will participate in the Skimboarding competition in Tanauan on April 28 while the riders from Batangas, Manila and Zambales will join the December Skim Competition, Mayor Tiu added. Mayor Tiu said that he will continue to promote skimboarding as a water sports for young people because he finds it safer. It also makes young people aware of and take care of the ocean and the environment. They do not want to make it dirty because it is their paradise, Mayor Tiu said. Mayor Tiu said that because of skimboarding, out of school youth in Tanauan were encouraged to go back to school. This is because Mayor Tiu does not allow them to join competitions if they are not enrolled. Skimboarding makes young people more responsible and inspires them to do better in class, Mayor Tiu added. MANILA – The Nacionalista Party (NP) is pushing for the quick passage new legislation raising by P9,000 over three years the minimum basic pay for public school teachers. "We are counting on the House of Representatives to promptly pass its version of the Senate-approved bill, and not to diminish in any way the upward salary adjustment for our teachers contemplated (in the Senate measure)," said NP spokesperson and former Cavite Rep. Gilbert Remulla. Remulla was reacting to reports that House members are now inclined to support a measure proposing a lesser salary increase to be staggered over a longer period. House Joint Resolution 24, authored by Speaker Prospero Nograles, proposes to provide teachers a pay increase of P6,000 staggered over four years. Remulla said the NP is batting for the P9,000-increase over a shorter period "as part of a wide-ranging strategy to reinforce the foundations of basic education." The Senate bill, strongly favored by teachers over the House measure, was approved last year. Sen. Manuel Villar Jr., the NP chief executive, presided over the Senate when the bill was passed. Senate Bill 2408 proposes to raise from Salary Grade 10 to Salary Grade 19 the entry-level pay for all teachers in the public school system. This means their starting monthly pay would be raised to a new range of P18,471 to P21,995. At present, their initial pay is in the range of P10,933 to P12,997. The Senate bill also seeks to grant additional benefits to teachers, including annual medical allowances and bonuses. "There is no question that due to inadequate reward, many highly qualified instructors have been leaving the public school system in favor of more gainful employment elsewhere, including overseas," Remulla said. He said any comprehensive plan to build up the school system "would be deficient if it does not include a substantial and swift upgrading of the emoluments for teachers." "The NP is absolutely committed to raising the quality of life of our teachers. Highly motivated teachers are absolutely imperative to reversing the rapid decline of basic education," Remulla said. "Solid basic education in turn is crucial to lifting more Filipinos out of poverty, and for the country to harness the human resources required for nation-building and forceful economic growth," he added. TACLOBAN CITY – Human Rights group in the region, Katungod-Sinirangan Bisayas, condemned on Sunday the brutal killing of Dr. Bartolome M. Resuello, 62 years old, last April 1, 2009. Dr. Resuello was shot several times in his body and head by unidentified men wearing bonnets using an M-16 rifle and .45 caliber which led to his instant death. The incident happened at around 5:30 PM on April 1, 2009 in Brgy. Cababtuan, Pambujan, Northern Samar while he was riding a motorcycle on his way to his other house in Pambujan. According to Dr. Resuello’s siblings, they do not know of any personal enemies of their brother that has a motive to kill him. “Dr. Resuello is a known activist in Northern Samar since the time of the Marcos dictatorship. He was the Chairperson of Bayan Muna Partylist in Northern Samar from 2000-2002 and one of the convenors of PESANTE-Northern Samar, an organization of farmers in the said province. There will be no one who has a motive to kill him but the state itself given its record of Extra-judicial Killings of known activists and leaders,” said Flor Chantal Eco, Secretary-General of Katungod-Sinirangan Bisayas. She further stated that the killing of Dr. Resuello is no doubt politically motivated because of his active participation in the national democratic movement and his selfless service to the poor through free medical services. “We call on all human rights advocates and peace-loving people of Eastern Visayas to rise in unity to condemn the brutal killing of people’s doctor, Dr. Bartolome Resuello and a unified call to all concerned agencies for their immediate action, intervention, and investigation to seek justice for Dr. Resuello,” ended Eco. TACLOBAN CITY – All is set for the Palarong Pambansa 2009 in Leyte, Governor Carlos Jericho Petilla said after listening to the report of the different committees for the national event. All the facilities are in place. The swimming pool has been turned over to the Province by the contractor and the oval will be turned over soon. Governor Petilla said that the City Government of Tacloban did not allow the use of the Tacloban City Convention Center for playing venues. The Sagkahan Gym was not also allowed to be used. However, other venues have been confirmed to be used instead of those which were not allowed to be used. All the billeting schools are ready. In fact, some delegations or advance parties have already arrived. Director Matugas informed that the beddings and the cots for the delegations were taken cared of by the DepEd teachers and supervisors. Regional delegations will come in groups starting April 17 up to April 23, DepEd secretariat informed. Governor Petilla said that the modest estimate of delegations overshot to twice as many. The transportation committee is ready with vehicles for the delegations. Dir. Matugas added that Calbayog City Mayor Sarmiento is lending 4 buses while Biliran Congressman Chong is lending 8 buses for the Palaro. During the meeting of the various committees for the Palaro which was held on April 17 at the Governor’s Hall of the Leyte Provincial Capitol, it was learned that except for small concerns which could easily be answered, all the committees have made the necessary arrangements and coordination. On the issue of water for use of the athletes who are billeted in different schools, Governor Petilla said that the Province will borrow fire trucks from the municipalities and will facilitate the use of extra receptacles or tanks for the different billeting areas. One of the concerns raised was that of security and traffic. The traffic flow plan was presented by PNP Leyte Provincial Director Palconit and suggestions were given by Governor Petilla as to the parking area for the buses bringing the delegates to the venues. Colonel Cleve Taboso informed the audience on the traffic rerouting especially during the Opening Program on the 28th of April. Col. Taboso also agreed in principle that he will facilitate for the issuance of permit for the Parade of athletes. Governor Petilla called on all the people to support and cooperate so that the hosting of the Palaro will be a successful one. He disclosed the report that a group is planning to go from one delegation to another to supply negative ideas on the Palaro. He added that a certain group is allegedly putting up a Palaro website where negative items will be featured. These could be countered by making people know about the positive things on the Palaro, the good Governor said. NAVAL, Biliran – President Gloria Macapagal-Arroyo visited the municipality of Naval, the capital town of the province of Biliran to unveil the marker of the newly completed Naval Port Development Project. The President, accompanied by Department of Transportation and Communication (DOTC) Secretary Leandro Mendoza and Department of Trade and Industry (DTI) Secretary Arthur Favila arrived at the Naval Institute of Technology (NIT) landing field via helicopter at 3:10 in the afternoon on Wednesday (April 15) and was warmly welcomed by Congressman Glenn Chong of the lone district of Biliran; Governor Rogelio Espina; NIT President Edita Genson; Col. Leonardo Cesneros, Philippine National Police (PNP) Provincial Director of Biliran and Major General Arthur Tabaquero, Commanding General of the 8th Infantry Division of the Philippine Army. The Presidential entourage immediately motored to the Naval Port passing through the thickly-lined crowd along Padre Inocentes Garcia Street. She was delighted and all smiles to see a throng of people at the gate of the port continuously waving their hands and saying “Mabuhay si Presidente Gloria”. Upon arrival at the Naval Port compound, the President and her entourage were warmly received by Engr. Dominador Licayan, Manager of the Philippine Ports Authority (PPA) – Port of Naval and Ormoc City and the local officials of Naval led by Vice Mayor Vicente Curso. After what it seems like a never-ending handshakes of the President with the local officials, guests, the Navalenos and the Biliranons, the unveiling ceremony of the marker of the newly completed Naval Port Development Project immediately followed. President Arroyo led in the unveiling of the marker and she was assisted by DOTC Secretary Leandro Mendoza, Congressman Glenn Chong, Governor Rogelio Espina and Naval Mayor Vicente Curso. Immediately after the unveiling ceremony, the President proceeded to the ramp of the port to send off MV Hansel Jobett, a roll-on-roll-off (RoRo) ship of the Santo Clara Shipping Company in its ceremonial trip to Cataingan in the province of Masbate passing through the island town of Maripipi as there were bus passengers who will disembark in the port of said town. MV Hansel Jobett ferried two big buses namely Eagle Star and Silver Star with passengers bound for Manila. After the send-off ceremony, the President went back to the Naval Port Passenger Terminal to take her snacks and for a very brief meeting with Congressman Chong, Governor Espina and other local officials at the holding room. The President also had a photo opportunity with the teachers of the Department of Education (DepEd) led by Dr. Sara Apurillo, Schools Division Superintendent of Biliran, local officials and other guests. President Arroyo and her party left for Tacloban at the NIT landing field via chopper at exactly 4:20 in the afternoon. Congressman Chong, Governor Espina, Dr. Edita Genson, NIT President and other local officials and guests were at the landing field to see her off. The completion and inauguration of the Naval Port Development Project would see a boost in the economic activity and tourism in the capital town of Naval in Biliran Province and will strengthen the links between the provinces of Masbate, Leyte, Cebua, Samar, Surigao and to other Strong Republic Nautical Highway Eastern Seaboard. The project, according to Engr. Dominador Licayan, Port Manager of Ormoc and Naval, has three components which included the provision of a passenger terminal building, the rehabilitation of the reinforced cemented pier and the construction of the RoRo ramp. The implementing agency of the project is the Philippine Ports Authority. The inauguration ceremonies were also attended by Department of Agrarian Reform (DAR) Assistant Secretary Edgar Igano, Land Transportation Franchising and Regulatory Board, Region 7 Director Romulo Bernanrdes, eight mayors of the province of Biliran, 132 barangay captains of the province, heads of national government agencies, officials of the local government unit of Naval town and the provincial officials of Biliran. TACLOBAN CITY – Athletes, coaches, officials and guests have started to troop to Leyte in batches in connection with the biggest sports competition in the country, the Palarong Pambansa 2009 which is expected to lure about 8,000 people. The Palarong Pambansa 2009 on April 26 to May 2, which is hosted by the Province of Leyte and the Department of Education Region 8, has also whetted the interest of national government officials. In fact, if plans will push through, a high profile meeting will be conducted in Leyte. Aside from the Palaro delegations, now ongoing in Leyte is the National Convention of Budget Officers of the Philippines and the National Convention of Ham Radio Operators. The advance parties and delegations of the 17 delegations participating in the 2009 Palarong Pambansa in Leyte have started to arrive since April 10, Dr. Edith Jacer of the Department of Education Region 8 informed. This early, all the hotels and inns in Tacloban City are already booked or blocked off, reports coming from the hotel and lodging house operators showed. The members of the Region 4-A (CALABARZON) delegation have started to arrive in Leyte on April 10, April 11, April 14 and April 17. All the members of the Region 4-B delegation are now in Leyte, Dr. Jacer added. They are billeted at the Leyte Normal University. The advance party for Region 1 or Northern Luzon has already arrived in Leyte and are now billeted at Palo II Central School. The full delegation will arrive on Saturday, April 18. The Region 2 or Cagayan Valley delegation will arrive in style in Leyte by plane in two batches on April 20 and April 21. They will be billeted at the Palo I Central School. The Region 3 advance party arrived in Leyte on April 12. The complete delegation will arrive via Matnog on April 18 and will be billeted at San Jose Elementary School. The Region 4-B (MIMAROPA) delegation has arrived in Leyte on April 15 and are now billeted at Leyceo de Verbo Divino. Meanwhile, the Region 5 or Bicol Region delegation has also arrived in Leyte on April 15 and are billeted at the San Fernando Elementary School. The delegation of Region 6 or Western Visayas will arrive in Leyte on April 23. They will be billeted at Sagkahan National High School. The advance party arrived on April 15. The Region 7 or Central Visayas delegation will arrive in Leyte on April 20 and will be billeted at the Eastern Visayas State University. The Region 9 delegation from Zamboanga will arrive in Leyte on April 19. They will be billeted at the San Jose National High School. The advance party of Region 10 will arrive in Tanauan, Leyte on April 17 while the rest of the delegation will arrive on April 20. They will be billeted at the Tanauan National High School and Tanauan II Central School. The advance party of Region 11 in Davao will arrive in Leyte on April 17 also. The rest of the delegation will arrive on April 20 and will be billeted at the Kapangian Elementary School. The entire delegation of Region 12 will arrive in Leyte on April 21 and will be billeted at the Tanauan I Central School and Tanauan School of Craftsmanship and Home Industries. The Region XIII delegation from Caraga will arrive on April 21 and they will be housed at the Panalaron Central School. The delegation from the Cordillera Autonomous Region will arrive on April 19 and will be billeted at the Rizal Central School. The advance party of the National Capital Region will arrive on April 18, 19 and 20. The rest of the delegation will arrive on April 22. NCR delegation is booked at the Dulag South Central School and Dulag National High School. The delegation from the Autonomous Region of Muslim Mindanao (ARMM) will arrive in Leyte on April 17 and will be billeted at the Santo Niño SPED Center. The delegation from the host region, Eastern Visayas or Region 8 have been in Leyte since the EVRAA and are housed at the Tacloban City Elementary School. On the other hand, the Technical Officials and Task Force of the Palarong Pambansa have been in Leyte since April 12 and are housed at the Leyte National High School and at Bethel International School. Keen on making the Palarong Pambansa 2009 a success, Leyte Governor Carlos Jericho Petilla saw to it that all the billeting schools have the necessary facilities for the athletic delegations. He also called on his fellow Leytenos and the entire people of Region 8 to show the highest courtesy and hospitality to the guests. TACLOBAN CITY – President Gloria Macapagal-Arroyo has launched on Wednesday at Brgy. Santo Simo Rosario, Naval, Biliran the 3rd Strong Republic Nautical Highway which strengthened the foundation of the oldest roll-on/roll-off (Ro-Ro) route of the 919 kilometers land and 137-nautical miles bounded on the sea. The new Eastern seaboard route commence from Pilar, Sorsogon and runs through Masbate City and Esperanza town in Masbate, then traverses Naval and Maripipi towns both located in the province of Biliran to San Ricardo in Southern Leyte and finally ends in Lipata, Surigao City in Surigao del Norte. The Strong Republic Nautical Highway has three main trunkline, the western seaboard route, the central seaboard route and the eastern seaboard route. According to Biliran Governor Dr. Roger Espina, the presence of roll-on/roll-off in the province of Biliran give accessible transportation from the neighboring parts of Biliran province to Cebu and as far as in Luzon and Mindanao which in turn boost the economic and tourism in Biliran as well in Leyte province. The construction has started on March 12, 2007 and was completed on July 6, 2008. Since 2008 it has already served a total of 52,208 passenger traffic in the Naval-Cebu-Naval route by MV Super Shuttle Ferry 5 of the Asian Marine Transport Corporation and MV Naval Princess of C. Ang Shipping Lines. Imagine the Naval-Cebu-Naval route which will save 8 hrs. of travelling time which was before the cities of Ormoc and Tacloban, both located in Leyte, are the main point of destinations when a resident of Biliran would want to go to Cebu would now lessen the burden and much more save time and money, said Gov. Espina. Gov. Espina is hoping that the presence of Shipping Lines in Naval, Biliran will become regular since a port has already established. The launching of the 3rd Strong Republic Nautical Highway Eastern Seaboard Route and the inauguration of the Naval Port Development Project in Naval, Biliran is timely, considering the “17th provincehood celebration” of Biliran is past approaching, since May 11 is the date of its provincehood is a few days more to go and we are expecting more visitors to come to the province of Biliran, said Gov. Espina. BRGY. BENIT, San Ricardo, Southern Leyte – “This is historic,” a resident here, his voice quivering in a mix of excitement, awe, and wonder, exclaimed. The unknown resident, and everyone else crowding around, watched Ocean King II, a sea-plying vessel, docked, opened its causeway bridge, and touched base with the new, multi-million peso Benit port. Minutes later, President Gloria Macapagal-Arroyo, who had waived to the cheering crowd earlier while she was still on-board the ship, alighted, then strode to the warm welcome of local officials and government functionaries who had stood under the heat of the noonday summer sun for hours, waiting patiently for her to arrive. Leading the pack of officials to welcome the President were Cong. Roger Mercado, his younger brother Gov. Damian Mercado, Vice-Governor Miguel Maamo, San Ricardo Mayor Virginia Meijia, Provincial Board Members, and Mayors, other officials, from the eighteen municipalities and one city of the province. Also joining the welcoming crowd were teachers, barangay officials of the nearby municipalities and the 70-strong barangay officials of the city of Maasin led by City Mayor Maloney Samaco, military and police officers, and some regional heads of national line agencies, including Bishop Precioso Cantilla of the Diocese of Maasin. President Arroyo stepped on the concrete pavement of the new, P72-Million ferry terminal facility at about 11:50 Wednesday morning, coming from an earlier engagement in Surigao City. It was another history-in-the-making unfolding right in front of everybody’s eyes, for no other President had crossed the narrow channel by sea from Surigao to San Ricardo in this northern tip of Panaon Island in Southern Leyte ever since living memory. Following the exchange of pleasantries and shaking hands of officials and the crowd, President Arroyo unveiled a marker of the new ferry terminal. She was briefed by Department of Transportation and Communication (DOTC) Secretary Leandro Mendoza on some facts in relation to the project, which was started in September, 2007, and was finished on January 5, 2009. Actual cost of the new passenger complex was P71,630,452.76, consisting of one unit roll-on, roll-off (RORO) ramp, reinforced concrete pier, rehabilitation and expansion of back-up facility with an area of 2,366 square meters, and construction of a terminal building with a floor area of 464 sqm. Joining the President’s party was Department of Public Works and Highways (DPWH) Secretary Hermogenes Ebdane, together with other high-ranking officials and Undersecretaries. The President had lunch inside the terminal building together with top officials and Bishop Cantillas. From Benit, she was scheduled to motor all the way to Liloan and drive-through the new concrete highway from Himay-angan to Hinundayan, some 90 kilometers distance, where a presidential chopper would take her to the next destination, in Naval, Biliran. Instead, the whole land trip was cut short up to Liloan only for lack of material time, since it was way past 1:00 in the afternoon already, and a helicopter ferried the President at the Liloan ferry terminal. MAKATI CITY – Metrobank Foundation, Inc. proudly announces the provincial finalists for the 2009 Search for Outstanding Teachers. Among the 99 provincial finalists selected by the Preliminary Boards of Judges, four of them are from the provinces of Samar, Leyte and Biliran. They are Mrs. Lourdes L. Matan of Mag-Ubay Elementary School in Calbayog City; Mrs. Brenda L. Acol of Dolores National High School in Dolores, Eastern Samar; Mrs. Natividad P. Kahano of Rizal Central School in Tacloban City, Leyte; and Mrs. Jennifer M. Dejarlo-Alvior of Bool National High School in Culaba, Biliran. All provincial finalists are required to submit supporting documents which highlight their outstanding qualities and competencies as educators as well as their involvements in their respective communities. Ninety-nine provincial finalists were chosen from a total of 173 nominees nationwide in the elementary, secondary and higher education categories. From these provincial finalists, only 40 will be declared regional finalists, which will be further trimmed down to 20 national finalists. It is from these national finalists that the 10 awardees for the 2009 Search for Outstanding Teachers will be determined. “The Search for Outstanding Teachers is one of the ways in which Metrobank Foundation advocates education,” said Metrobank Foundation president Aniceto Sobrepeña. “Through this search, we aim to provide models of excellence who can inspire teachers all over the country to be the best in their profession. We are now looking forward to honor the ten best educators in the country today,” he continued. For 25 years, the Search for Outstanding Teachers has been honoring the teaching profession by according special recognition to teachers who manifest profound commitment to the development of the youth through exemplary competence, remarkable dedication to their work and effective educational leadership. TACLOBAN CITY – The Palarong Pambansa, the country’s biggest sports event which opens on April 27 to May 2, promises a higher level of competition and the full use of technology in delivering real time games results to the spectators. The Department of Education said that whatever is the latest in the international standards of sports events, it will be applied in the Palaro in Leyte, in line with DepEd’s thrust to continue to raise the level of competition as well as the management of the Palaro. DepEd will make full use of ICT in ensuring that the public is updated on the results of the games. Immediately after each event is played, the results may be viewed on-line especially by those who cannot be at the venue. Wide screen projectors will also be installed in strategic areas. Governor Carlos Jericho Petilla and the other provincial officials of Leyte saw to it that the athletes will have a good venue for the Palaro 2009. The venue of the Palaro is the newly refurbished Leyte Sports Development Center in Tacloban City, Leyte and the results of the events will be viewed by the spectators through the local television and heard by the public through a private and government radio stations. The result of the games could also be read at various websites which include http://depedtfss.wikispaces.com; leyte.gov.org; and pia.8.tk. About 15,000 athletes and school officials from 17 delegations representing public and private elementary and secondary schools all over the country will see action in the week-long sporting event which is hosted by the Provincial Government of Leyte and the Department of Education Region 8. Director Sol F. Matugas said there will be 17 events for the secondary level and 14 events for the primary level. The athletes competing in the Palaro emerged from the elimination round in regional athletics meets held months and weeks before the grand Palaro. 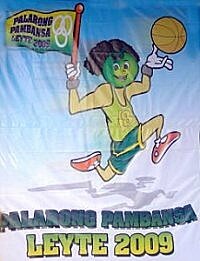 The Province of Leyte is providing the venues and facilities for the Palaro. On the other hand, DepEd handles the technical management of the Palaro including the procurement of technical equipment needed for the events. DepEd is ensuring the integrity of the games by conducting reorientation of the chairs in the screening committees in the district, division and regional levels so that they will be updated on the rules for screening and accreditation of athletes. PASAY CITY – Opposition Senator Chiz Escudero on Sunday reiterated his position that the tax relief law exempting minimum wage earners from income tax should cover salaries and wages of qualified beneficiaries for the entire 2008. The senator issued the statement in light of the national government’s position that the relief being extended by Republic Act 9504 to qualified taxpayers covers only half of last year. “RA 9504 is a piece of social legislation aimed at alleviating the plight of our poor countrymen in these times of economic hardship. A contrary interpretation defeats the spirit behind the enactment of this law,” said Escudero, who sponsored the bill as chairman of the ways and means committee in the Senate. The law, which took effect last July 6, also increased the personal exemption for individuals as follows: single – from P20,000 to P50,000; head of family – from P25,000 to P50,000; each married individual – from P32,000 to P50,000; and each qualified dependent (not exceeding four) – from P8,000 to P25,000. “This law was particularly designed to aid our fellow Filipinos from the low income group, particularly laborers. Their already meager salary and wage should now be exempted from income taxation for the whole of 2008 as it was Congress’s intention that the law be made retroactive starting January 1, 2008,” Escudero said. The senator emphasized that as the deadline for filing tax returns approaches on April 15, the Bureau of Internal Revenue should follow what lawmakers envisioned in the law. In September last year, Escudero, as co-chair of the Congressional Oversight Committee on Comprehensive Tax Reform Program (CTRP), joined Rep. Exequiel Javier in maintaining that RA 9504 is a social legislation intended to provide relief to the plight of minimum wage earners and low-income taxpayers. He said the committee maintains its position that there is no such thing as a half taxable year, citing court rulings on the cases of Umali v. Estanislao and Ingall v. Trinidad. The two rulings clearly state that new rates of personal and additional tax exemptions are available upon the filing of income tax returns on or before April 15 after the end of a calendar year. Therefore, Escudero said, when RA 9504 took effect in July last year, the new tax exemptions can be availed of this income tax filing season. “As a consequence, such tax exemptions apply to income earned or received in the calendar year 2008,” he said. Escudero also said that if the BIR insists on its erroneous interpretation of the law, the committee will be compelled to bring the issue to the appropriate court. TACLOBAN CITY – There is really a need to intensify campaigns for the protection of seaturtles and other marine creatures, Mayor Roque Tiu of Tanauan, Leyte said. Mayor Tiu informed that about a dozen of sea turtles, the population of which is endangered of extinction, have been rescued in the municipal waters in the past months. This week, two more sea turtles got entangled, in two separate occasions, in the fishing nets of Tanauan fishermen, Mayor Roque Tiu informed. This made the total seaturtles rescued in Tanauan to 12, Mayor Tiu added. Just recently, a Tanauan fisherman rescued a giant green sea turtle which was estimated to be over a hundred years old and weighing more than 200 pounds. On Tuesday, Mayor Tiu, together with Mr. Tito Simbulan, chief of the Protected Areas and Wildlife Coastal Zone Management Service of the Department of Environment and Natural Resources, supervised the return of the sea turtles to their natural abode. On April 6, Monday, Roel Dupalo-Pante, a fisherman from Barangay Cabuynan of Tanauan, reported that a ‘pawikan’ got entangled in his fishing net. The pawikan belongs to the green sea turtle specie with a carapace measuring 64 centimeters in length and 65 centimeters in width. It was tagged as PH 05676. In the morning of April 7, another sea turtle was found by Rolando Camero, another fisherman from Barangay Cabuynan. The pawikan is an olive ridley sea turtle with a carapace measuring 46 centimeters in length and 42 centimeters in width. Mayor Tiu expressed his appreciation to the two fishermen for their commitment to the protection of seaturtles and other marine creatures. He said that sea turtles are referred to as the only living remnants of the dinosaur age, but maybe not for long. Unless sincere efforts are undertaken, sea turtles might follow the dinosaur to extinction. Sea turtles, popularly known in the Philippines as pawikan, belong to the sub-order Cryptodira, and to the families Dermochelyidae and Cheloniidae. There are more than 220 species of turtles in the world, but only seven are considered marine (saltwater). Five of these species are present in the Philippines. These are the Green (Chelonia mydas), Hawksbill (Eretmochelys imbricata), Loggerhead (Caretta caretta), Olive Ridley (Lepidochelys olivacea) and the Leatherback turtles (Dermochelys coriacea). TACLOBAN CITY – The Department of Public Works and Highways in Region 8 is fast tracking the completion of the Calbayog-Gatanguit Road, a report at the DPWH website stated. The project which is part of President Gloria Macapagal-Arroyo’s SONA commitment is aimed at rehabilitating and improving the economy of Calbayog City and the other municipalities in Samar province. It would be recalled that President Arroyo is determined to fulfill her SONA commitments before her term ends in 2010. The project consists of improvement and widening of road; upgrading and widening road tracks and shoulders; building better drainage facilities and slope protection; and building road safety devices alongside the existing 52.7 kms road, along Maharlika Highway. The road project also includes replacement of two (2) bridges and rehabilitation of thirteen (13) more bridges located along the Calbayog-Gatanguit road section. The Calbayog-Gatanguit Road Section is under Package III of the Arterial Road Link Development Project and entails the improvement and upgrading of about 52.7 kilometers of existing road. The project, Director Angelito Twano informed started in November of 2006 and is scheduled to be completed by August of 2009. Considering that Samar is located in the country’s typhoon belt and runs along the route being passed by commuters from Luzon to Mindanao and vice versa, the road network is constantly subjected to destruction, and deterioration of roadways and shoulders, thus, the DPWH took immediate actions in rehabilitating and improving the road section. DPWH Secretary Hermogenes E. Ebdane Jr. said that taking immediate actions are necessary in improving the national road net. He also added that the DPWH does not only rehabilitate or reconstruct roads immediately but also continue producing new, lasting, safe and efficient roads and bridges to be more convenient.